At one time, the insulin of choice for cats was Humulin NPH (N). This is an insulin with the molecular structure of human insulin and is very valuable in the treatment of human diabetes. It is a poor choice in treating feline diabetes although a number of veterinarians still aren't aware of newer choices. Deborah Greco, DVM, Ph.D., a leading world expert in the treatment of feline diabetes, bluntly stated as early as 2005, “There is no rationale at all for using NPH (N insulin) at all in a cat. Period.” Dr. Greco says this is because onset of action and peak of action times are totally variable in cats with N, even in the same cat. What does molecular structure have to do with it? Insulin is a protein and that means it is made up of amino acid building blocks. Depending on the type and arrangement of the amino acids, the insulin molecule forms different 3-D shapes. There are a variety of insulin molecules. Cat insulin is considerably different from human insulin. So what if they don't look the same? Well, they don't ACT the same, either. You will read a lot about "onset of action" and "peak of action" times and these characteristics are critically important in controlling diabetes. So, let's look some more at these characteristics and then compare some different insulins. Simple graphs are the best way to make the comparisons. Onset of action simply means when the insulin starts working to lower the blood sugar. This takes some time! You inject insulin under the skin, where it has to be absorbed into the blood stream. Some insulins act more quickly than others; that is, some are more prompt than others. And when they start acting, they are not at their "peak of action." 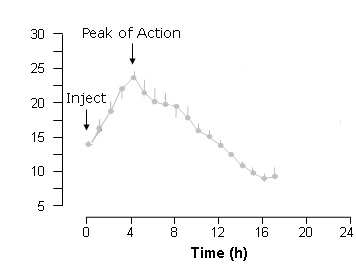 At the peak, the insulin is working the hardest to decrease blood sugar. (Remember, blood sugar goes up, insulin amounts starting going up to work on the blood sugar, insulin has its maximum or peak affect on blood glucose, and then tapers off. There is an inverse relationship between insulin and blood glucose.) It can be a long time or very quickly once they peak. Insulins have different durations, too. Some may work for only a few hours, some a whole day. So, which insulin is going to be used for your cat? As mentioned before, Humulin N is still used by a lot of veterinarians and it is certainly better than no insulin, but there is no reason to use it when vastly superior insulins are available for treatment of feline diabetes. PZI was become the insulin of choice for veterinarians tutored by pharmaceutical representatives, but it is being phased out because of the obvious advantages of insulins such as glargine (Lantus) and detemir (Levemir). A veterinary conference at Ohio State University in the fall of 2006 addressed the problem of what insulin to choose. If you want to read the entire lecture transcript, see reference 3 below. Insulin and Injections - please note that some of these articles need to be updated. For the latest on insulin use, see the Feline Diabetes Message Board (FDMB). Selecting an insulin for treatment of diabetes mellitus in cats and dogs by Robert W. Nelson DVM, 2006. Please see the above FDMB reference also for the latest protocols and insulin.